Social Customer Service benefits for growth of their business. In the past business owners would have asked themselves what relevance is customer service in social media to the growth of their business. In today’s business world one thing is clear: social media is a vital marketing channel to grow and manage your brand. Take your business to another level using Social CRM (customer relationship management). With Social CRM we blend techniques and technology to enable organizations to engage with their customers, this allows business owners analyze the reaction of the customer towards their brand and overall performance of their business. 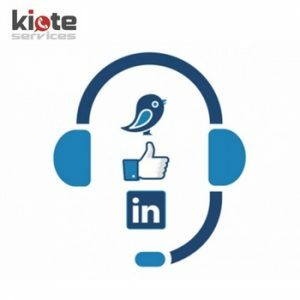 With Social CRM, Kiote Services can help map different campaigns and initiatives, manage campaigns across different social media platforms, and gain better insight into customers’ general online behavior. Kiote Services utilizes tools to help monitor your performance for better insights into customer’s engagement towards your brand and business, e.g. Brand Monitoring and Social CRM Analytics etc. Looking for the ideal organization to get the word out with these functions? At Kiote Services we can help you grow your customer base & improve your brand through our Social Media Advertising. With our skilled professionals to assist your business, we will meet and exceed your expectations. At Kiote Services, we offer greatness.